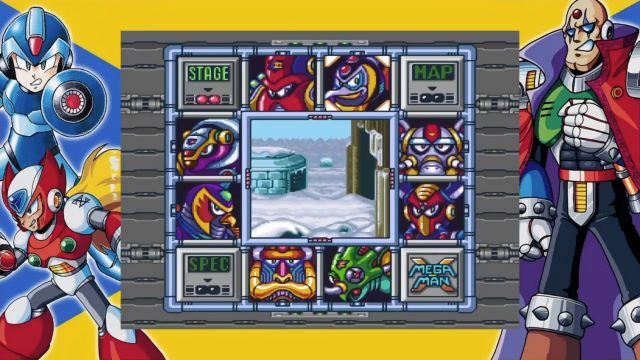 Capcom’s Mega Man X action-platformer is split into 10 stages, the first being a tutorial or introduction stage, 8 main stages and then the final stage. Any of the 8 main stages can be done in any order you choose but clearing a stage will have an affect on other stages for better or for worse, so be alert on the select changes. Below is a guide for the Snow Mountain stage and it’s boss, Chill Penguin. I will explain each enemy, how to counter them and enemies you will face in this stage. In this stage players will face a few different enemies that include Ray Bits, Batton Bones, Axe Maxes, Flammingles and of course the final boss Chill Penguin. Each enemy requires a different strategy to overcome them, read on for all the best tips on defeating them efficiently. Move forward until you run into Ray Bit, a rabbit mechaniloid, take it out and keep on moving. Run up the hill until reach Axe Max, a lumberjack mechaniloid. Avoid the sections of the log he will chuck your way and take him down with a charged Mega Buster shot. Be careful of the Bomb Been the wasp enemy, who will continue to follow you during this part of the stage, along with several Ray Bits. They will not let up until player reaches the next Axe Max. After you take him out and you should reach a cave. In the cave will be several Batton Bones which are flying bat enemies. They are extremely weak so just a simple buster shot will defeat them with no trouble. Once players advance further past the Batton Bones, they will run into several Spikeys. If they are giving you trouble shoot with a semi charged shot to knock them over and will become easier to dispatch. Their momentum will continue to block your path so be careful to avoid or they will run into you. 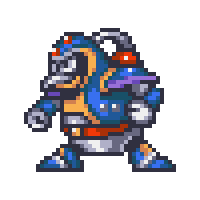 Following the path of the level, players will find a Light Capsule which encloses the dash upgrade for Mega Man X. Mega Man can now dash which allows him to move faster and jump further. Players can now also duck to avoid enemies projectiles which will come in handy later on. At the end of the cave players will encounter Flammingle, a flamingo like enemy whose head contains a saw. Try to destroy them from a safe distance as to avoid the saw blades slicing you up. Players will then run into Ride Armor, a robot suit which can be piloted by the player. You can now jump and punch while in the suit as well as absorb a good amount of damage but it also can be lost when taking too much damage. Players should abandon it early on preventing taking damage from the explosion that suit will expel when this happens. The next enemy will be Tombot, a dragonfly that will emerge from various igloos so be wary of these. There is a pole located on the ground, players must jump using the Ride Armor, then eject from the armor to make the leap to a ledge. There will be a Heart Tank for players to obtain, but only if they possess the fire wave weapon from Flame Mommoth. Use the Fire Wave on the first igloo, and it will reveal the Heart Tank. Up ahead there will be an Armor Soldier sporting his own armor suit, use your own to get rid of him quickly. Soon enough players will have to leave their armor behind to advance to the next level as it cannot be taken with you. There will be snowballs descending the slopes being pushed down by Snow Shooters, these are long legged robots. This part of the stage is just avoiding or destroying the snowballs, while taking down the Snow shooters. At the end of this path there will be the entrance to Chill Penguin which is the boss of this stage. Chill Penguin boss can create decoys of himself to distract players while shooting ice pellets. At times he will slide around the room, during this animation he cannot take damage . Chill Penguin has the ability to create a blizzard, be wary of this attack as he will pull you towards him or blow you away. Use your dash to avoid colliding with him during blizzards or when he will jump around the level. Chill Penguin may use his chill breathe which will not damage you but will slow you down by freezing you in place. 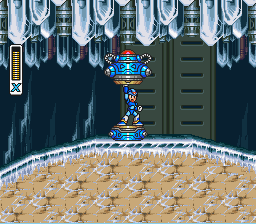 To easily take him down use your charged Mega Buster while perched up in a corner. If hit by Shotgun Ice, players will lose two bars of health. If you come in contact with one of his ice statues, you will lose four health bars. If you come in contact with Chill Penguin, you will lose six health bars so try to avoid him as this deals a large amount of damage. He is weakest against the use of Fire Wave, use that method of attack to make quick work of him. 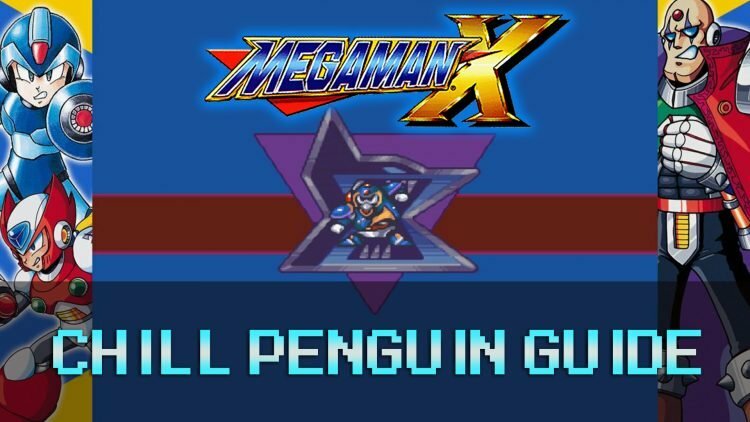 Note: After defeating Chill Penguin, you will receive Shotgun Ice which is Spark Mandrill’s weakness. This weapon is necessary if you want to get the Tower Stage Heart Tank without returning there. Flame Mammoth‘s stage now becomes a lot easier, as the cold air from the mountain blows down to factory freezing the lava. Depending in which order you defeat each stage, will the affect the ones that remains. So I would suggest taking on Spark Mandrill next since you have his weakness.